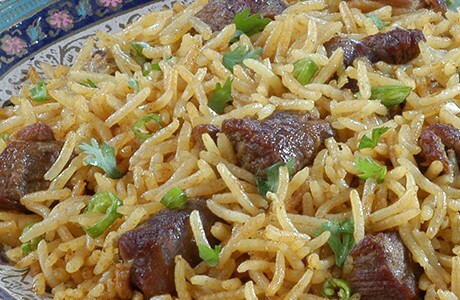 Tender lamb is cooked in a simple marinade of garlic-ginger paste and salt then cooked together with fluffy basmati rice. Serve garnished with green coriander and green chillies for a fresh contrast to the delicious meat. Heat the oil in a deep pan; add the onions and sauté until light brown. Reduce heat to low and add the yoghurt and spice mixture. Mix well and continue to fry until the yoghurt is absorbed. Add the lamb and salt. Add enough water so that all is absorbed when the lamb is tender; Cook on low heat until the lamb is tender. Add the drained rice and stir slowly to mix well. Add 4 cups water and bring to the boil. Reduce heat and cook until the rice is tender and fluffy and all the water is absorbed. Mix very carefully and serve garnished with green coriander and green chillies.